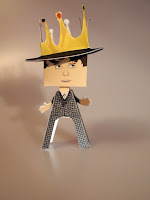 This paper people is Joey Page, the papercraft is created by sally. As a multi talented singer / songwriter/ producer, Joey Page is a star on the rise. The Orlando native has spent most of his young life immersed in the entertainment industry. He has embraced all aspects of the music industry and is growing musically at an alarming pace. Joey’s roguishly handsome looks, charm and cool as can be swagger makes him equally hip to the young girls that swoon for him as to the young guys that want to be like him.